One of the good things about Best Scene moments in the daily reviews is the ability to reuse them as Friday Night Fights…especially when it’s a fight this…comics. I don’t know how else to describe it. It’s a robot T-Rex punching a space squid while singing what I think is the Jaws theme. Or the 60’s Batman theme, and I”m not sure which would be cooler. And the odd part? It’s not Super Dinosaur. 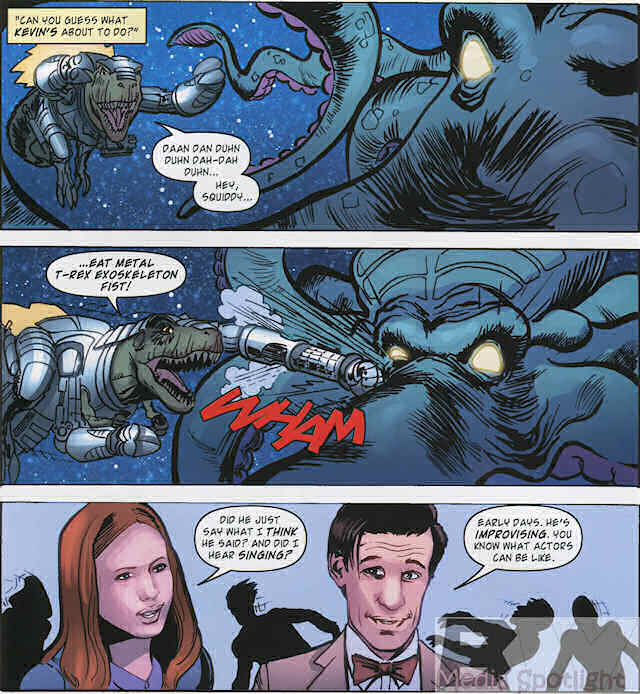 The TARDIS crew currently includes the 10th Doctor, Amy, Rory, and Kevin the robot dinosaur that used to work at a theme park. Now they’re on a station where a space squid is turning everyone into zombie followers. (More the voodoo zombie than the usual undead kind.) So the Doctor makes an exoskeleton so Kevin can visit the squid in its own turf…in space. Robert Kirkman, the gauntlet is cast! Outdo this, I dare you! As of yet Kirkman has at best matched this. Head to Spacebooger.com before Sunday night and vote for your favorite Friday Night Fight! (Forum membership is NOT required to vote, only to comment.) Winners of these 12 round enter the Prize Fight so feel free to join in. We could use the competition. Check Spacebooger’s on Tuesday for rules and information. Posted by ShadowWing Tronix on November 1, 2013 in Friday Night Fights, Television Spotlight and tagged Doctor Who, Josh Adams, Super Dinosaur, TARDIS, Tony Lee.